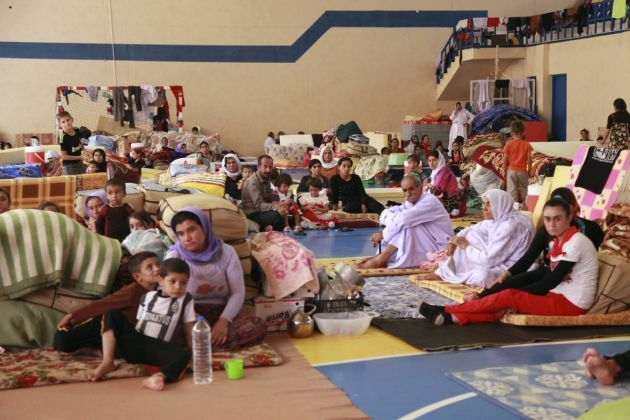 (Photo: REUTERS / Ari Jalal)Displaced people from the minority Yazidi group, fleeing violence in the Iraqi town of Sinjar west of Mosul, take refuge at Dohuk province, August 29, 2014. GENEVA - The United Nations human rights office has received reports that the Islamic State of Iraq and the Levant (ISIL, IS or Da'esh) is attempting to forcibly transfer tens of thousands of civilians closer to Mosul. This is including near its own military installations, which could be targets as the Iraqi government's offensive to retake the city intensifies said the office of the UN High Commissioner for Human Rights. In Baghdad, Save the Children says that up to 600,000 children are among the civilians trapped in jihadist-held Mosul and has called for for safe corridors as Iraqi forces advanced on the city. "It is a critical moment to protect children and open safe routes to allow the 1.5 million civilians, including about 600,000 children, still trapped in the city to leave safely," the charity said Nov. 1, AFP reports. Iraqi forces reached the outskirts of Mosul, two weeks into a massive operation to retake the city they lost to the jihadist group in June 2014. "We cannot sit back and wait for another situation like Aleppo to unfold, whilst there is still the opportunity to get children out of the war zone," the NGO's Iraq director Maurizio Crivellaro said. In Geneva the U.N. rights office reported that early Nov. 1, ISIL attempted the forcible transfer of some 25,000 civilians towards locations in and around Mosul. While coalition flights patrolling the area foiled the effort, some buses did reach Abusaif, 15 kilometres (9 miles) north of Hamam Al-Alil City, south of Mosul. "We have grave concerns for the safety of these and the tens of thousands of other civilians who have reportedly been forcibly relocated by ISIL in the past two weeks," OHCHR spokesperson Ravina Shamdasani told journalists. She said ISIL has brought dozens of long trucks and mini-buses to Hamam al-Alil City – most of which were prevented from proceeding towards Mosul by coalition flights. "Using civilians as human shields is a war crime. Under article 8(2)(c) of the Rome Statute of the International Criminal Court, taking of hostages in a non-international armed conflict is a war crime," said Shamdasani citing Article 8 says ordering the displacement of civilians for reasons not connected with their security or imperative military reasons is also a war crime. The Asyrian International News Agency reported that, "after a week of hard fighting last month, Iraqi government forces drove ISIS from the town of Bartella, liberating a stronghold of Iraqis who belong to the Assyrian Orthodox Church. "In their euphoria, Christian militia, who call themselves the Nineveh Plains Force, used two broken pieces of lumber to cobble together a cross. They climbed to the top of the Mar Shmony Church and erected the cross on the dome. "One of the militiamen draped the cross with an Iraqi flag, another set up a Nativity scene he had found in the rubble, while still another rang the church's bell, which somehow had been overlooked by the Islamic State vandals." In New York, the Special Adviser of the UN Secretary-General on the Prevention of Genocide has condemned in the strongest terms the continued, absolute disregard for international human rights and international humanitarian law by the Islamic State of Iraq and the Levant. Adam Deng was speaking in a statement from New York saying ISIL, or Daesh or IS as it is also known, has been demonstrated in the context of ongoing military operations in and around Iraq's second city of Mosul. "Recent reports cite the abduction and execution by ISIL of large numbers of civilians, the use of civilians as human shields and incitement to violence by ISIL's leaders," said Deng. "There have also been reports of use of chemical weapons and collective punishment of members of Iraqi Security Forces and their relatives." On Oct. 31, according to local reports, ISIL attempted to forcefully transfer as many as 25,000 people from the town of Hamam al-Alil to Talafar District, Mosul District and Abusaif town said the UN report. This is the location of a military base where ISIL has reportedly carried out mass killings of civilians. "The Special Adviser expresses grave concern for the safety of these civilians and the tens of thousands of others who have reportedly been forcibly relocated to be used as human shields. ISIL is likely to increase such tactics as the military operation progresses," he said. Deng stressed the importance of accountability for crimes committed by ISIL, noting that existing allegations are sufficiently strong for action to be taken immediately. He reiterates his call for all evidence of criminal activity to be properly documented and secured for future consideration by a court of justice. Deng also reminded the Iraq government that its military operations must be conducted with full respect for international law. He said all allegations of retaliatory violence by the security forces or by armed militias associated with them should be addressed effectively and without delay. "Under international law, command responsibility means that those in authority will be held accountable for the actions of forces under their control."